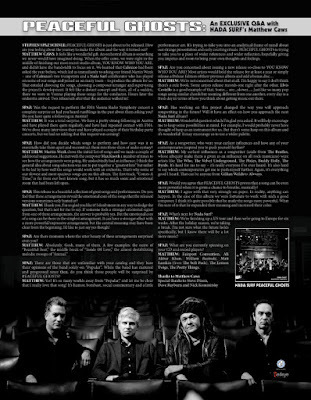 Discussions Magazine Music Blog: NADA SURF: An EXCLUSIVE Q&A with Matthew Caws! 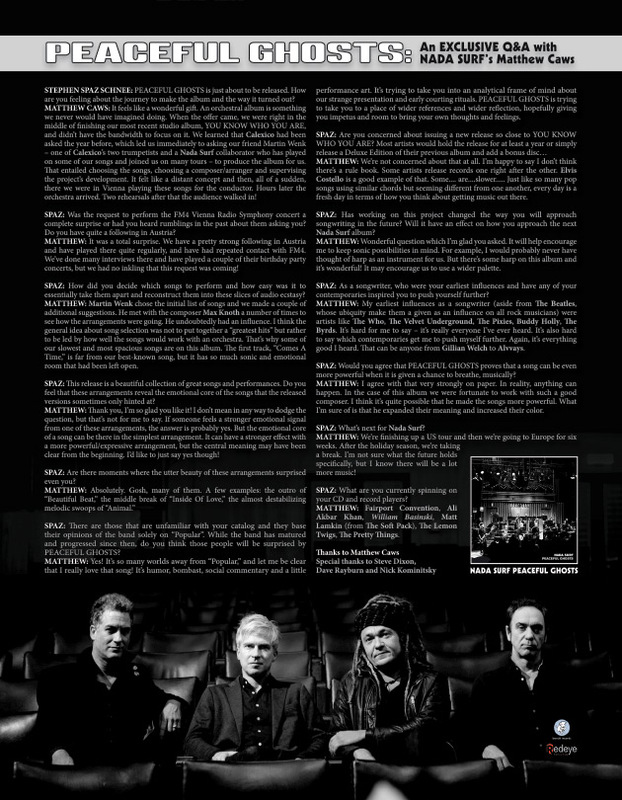 NADA SURF: An EXCLUSIVE Q&A with Matthew Caws! MATTHEW CAWS: It feels like a wonderful gift. An orchestral album is something we never would have imagined doing. When the offer came, we were right in the middle of finishing our most recent studio album, YOU KNOW WHO YOU ARE, and didn't have the bandwidth to focus on it. We learned that Calexico had been asked the year before, which led us immediately to asking our friend Martin Wenk – one of Calexico's two trumpetists and a Nada Surf collaborator who has played on some of our songs and joined us on many tours – to produce the album for us. That entailed choosing the songs, choosing a composer/arranger and supervising the project's development. It felt like a distant concept and then, all of a sudden, there we were in Vienna playing these songs for the conductor. Hours later the orchestra arrived. Two rehearsals after that the audience walked in! SPAZ: Was the request to perform the FM4 Vienna Radio Symphony concert a complete surprise or had you heard rumblings in the past about them asking you? Do you have quite a following in Austria? MATTHEW: It was a total surprise. We have a pretty strong following in Austria and have played there quite regularly, and have had repeated contact with FM4. We've done many interviews there and have played a couple of their birthday party concerts, but we had no inkling that this request was coming! SPAZ: How did you decide which songs to perform and how easy was it to essentially take them apart and reconstruct them into these slices of audio ecstasy? MATTHEW: Martin Wenk chose the initial list of songs and we made a couple of additional suggestions. He met with the composer Max Knoth a number of times to see how the arrangements were going. He undoubtedly had an influence. I think the general idea about song selection was not to put together a "greatest hits" but rather to be led by how well the songs would work with an orchestra. That's why some of our slowest and most spacious songs are on this album. The first track, "Comes A Time," is far from our best-known song, but it has so much sonic and emotional room that had been left open. SPAZ: This release is a beautiful collection of great songs and performances. Do you feel that these arrangements reveal the emotional core of the songs that the released versions sometimes only hinted at? simplest arrangement. It can have a stronger effect with a more powerful/expressive arrangement, but the central meaning may have been clear from the beginning. I'd like to just say yes though! SPAZ: Are there moments where the utter beauty of these arrangements surprised even you? MATTHEW: Absolutely. Gosh, many of them. A few examples: the outro of "Beautiful Beat," the middle break of "Inside Of Love," the almost destabilizing melodic swoops of "Animal." SPAZ: There are those that are unfamiliar with your catalog and they base their opinions of the band solely on “Popular”. While the band has matured and progressed since then, do you think those people will be surprised by PEACEFUL GHOSTS? MATTHEW: Yes! It's so many worlds away from “Popular,” and let me be clear that I really love that song! It's humor, bombast, social commentary and a little performance art. It's trying to take you into an analytical frame of mind about our strange presentation and early courting rituals. PEACEFUL GHOSTS is trying to take you to a place of wider references and wider reflection, hopefully giving you impetus and room to bring your own thoughts and feelings. MATTHEW: We're not concerned about that at all. I'm happy to say I don't think there's a rule book. Some artists release records one right after the other. Elvis Costello is a good example of that. Some.... are....slower..... Just like so many pop songs using similar chords but seeming different from one another, every day is a fresh day in terms of how you think about getting music out there. SPAZ: Has working on this project changed the way you will approach songwriting in the future? 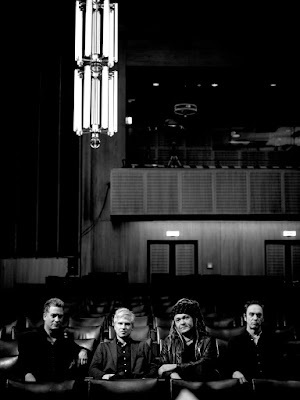 Will it have an effect on how you approach the next Nada Surf album? MATTHEW: Wonderful question which I'm glad you asked. It will help encourage me to keep sonic possibilities in mind. For example, I would probably never have thought of harp as an instrument for us. But there's some harp on this album and it's wonderful! It may encourage us to use a wider palette. SPAZ: As a songwriter, who were your earliest influences and have any of your contemporaries inspired you to push yourself further? MATTHEW: My earliest influences as a songwriter (aside from The Beatles, whose ubiquity make them a given as an influence on all rock musicians) were artists like The Who, The Velvet Underground, The Pixies, Buddy Holly, The Byrds. It's hard for me to say – it's really everyone I've ever heard. It's also hard to say which contemporaries get me to push myself further. Again, it's everything good I heard. That can be anyone from Gillian Welch to Alvvays. SPAZ: Would you agree that PEACEFUL GHOSTS proves that a song can be even more powerful when it is given a chance to breathe, musically? MATTHEW: I agree with that very strongly on paper. In reality, anything can happen. In the case of this album we were fortunate to work with such a good composer. I think it's quite possible that he made the songs more powerful. What I'm sure of is that he expanded their meaning and increased their color. 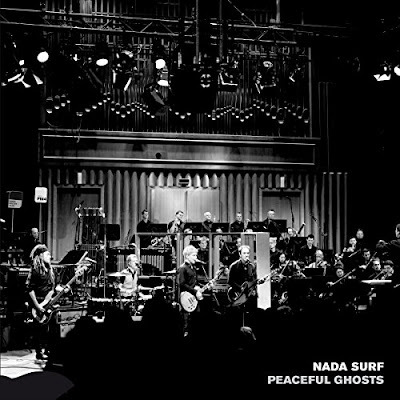 SPAZ: What’s next for Nada Surf? MATTHEW: We're finishing up a US tour and then we're going to Europe for six weeks. After the holiday season, we're taking a break. I'm not sure what the future holds specifically, but I know there will be a lot more music!